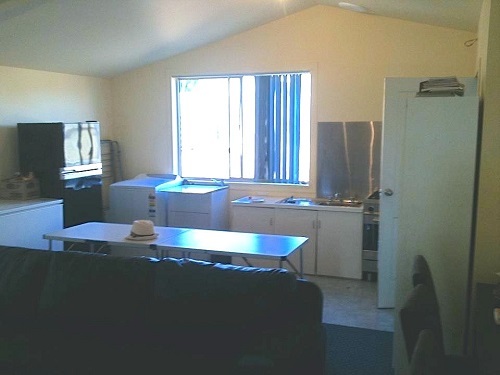 Some of us have large storage needs or require a workshop to get jobs done, wethers its professional for a hobby. Sometimes we need a big workshop or garage to add to our homes, and getting a quality building at an affordable price is the goal! 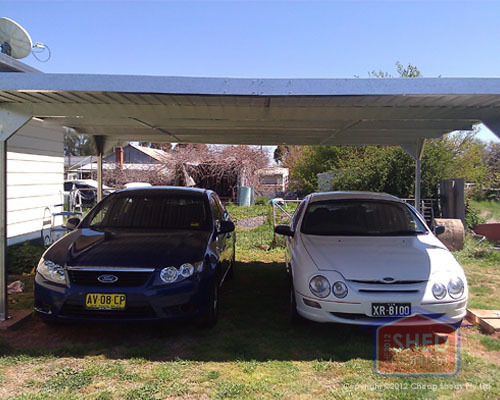 Below you will find stories and reviews sent in from our Cheap Sheds customers who love their Workshops and Garages. 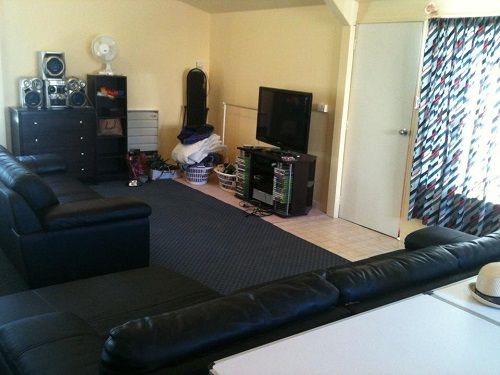 Hi Michelle, sorry for the delay in response to your email but things have been busy since moving into our new home. One of the first things I required was a good quality garden shed and after looking around at all of my local suppliers I really found nothing that interested me. 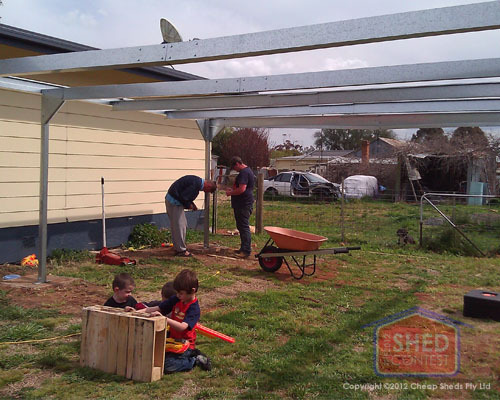 My son came out and told me about his experience with your company and the quality of the shed he Had purchased from you. After some thought I decided that I will also purchase my shed through you. 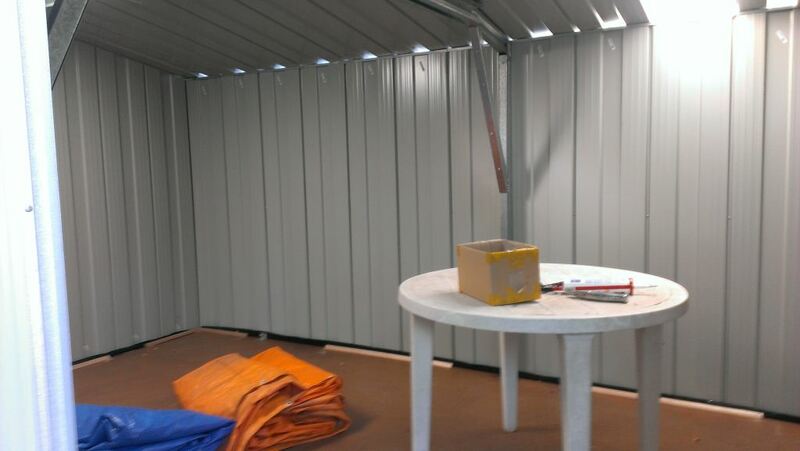 The first thing I noticed when I unpacked my shed was the quality of the materials use in the fabrication of the shed as well the labeling of all sections this made the building of the shed very easy indeed. Michelle I was able to build all walls and roof by my self with the only help needed was in the moving of the sections when completed to make way for the next section. 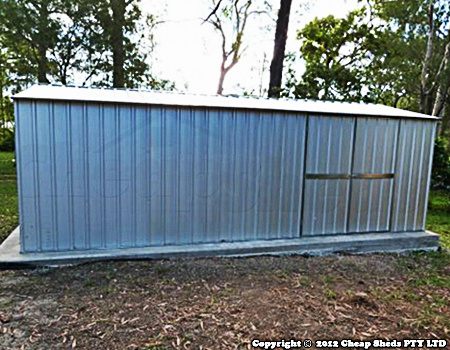 To cut a long story short my end result is I have a 4.5 X 3.0 shed standing proud and sturdy in my back yard. 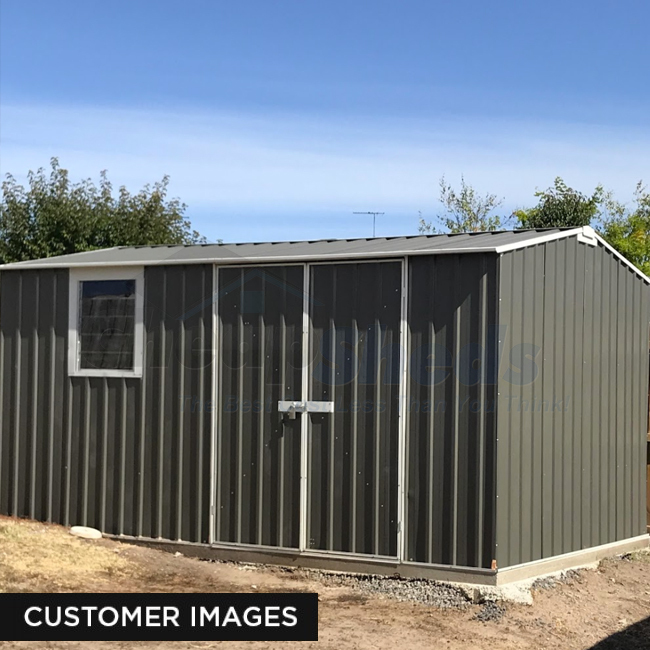 Michelle I would have no hesitation in recommending your products to all of my family and friends or any other person that is in the market for a good and well priced garden shed. As this was my first real experience buying a large item on line I would like to thank you and all of your staff at Cheep Sheds for making my experience stress free and also to the driver that delivered the shed to my address what a great job he done placing it where he did. Thank you all. 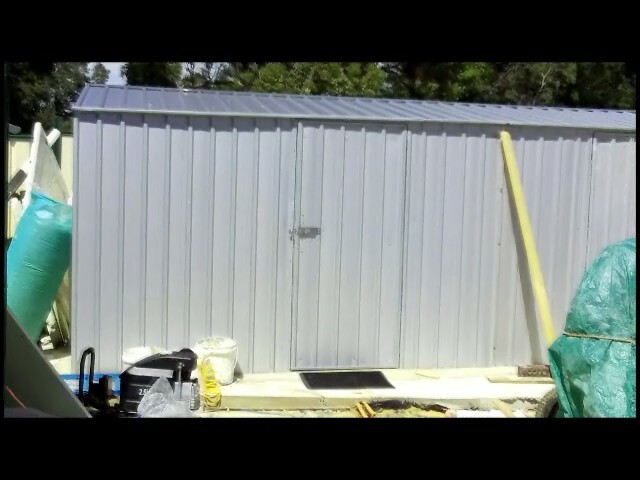 Purchased an Absco double garage and my boys helped me put it up making it a family shed, as every man needs his shed. It was a pleasure to install with easy step-by-step instructions. My sons have pulled their motorbike apart in the shed while we are finishing the trims, they couldn't wait to use it. My wife says to put a bed in there and move into it. I don't know what I was doing without this shed. 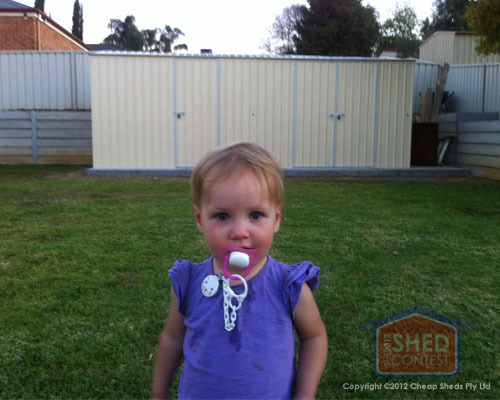 Thank you Cheap Sheds and thank you Krisztian for your ongoing support. 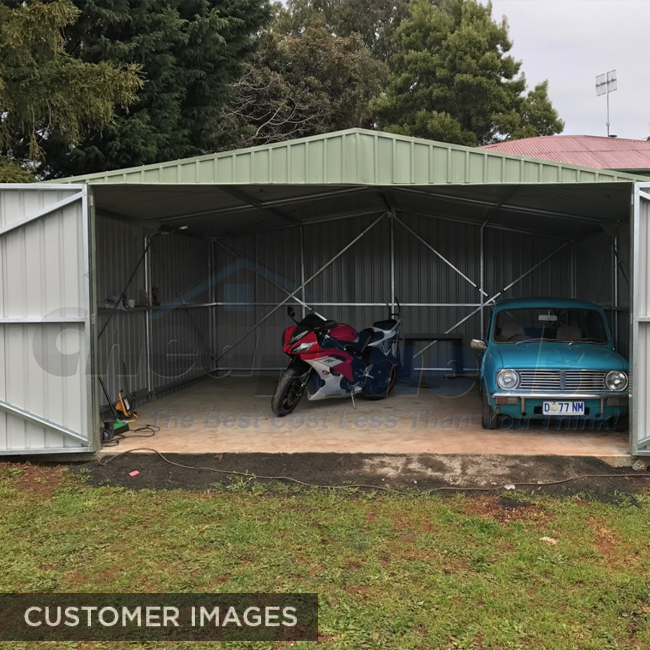 Having previously purchased a garden shed from you, and been happy with it, we bought the double garage when my son in Sydney wanted to get his collectable cars away from the sea air. 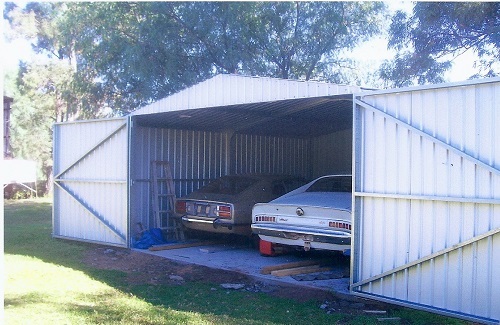 We live in Dubbo, well away from the sea, so he thought we were a handy spot for storage. I did use some improvements of my own, however. I used pop rivets throughout, instead of the selftappers supplied, and as we are in the middle of a mouse plague, I have added reverse angle on the door to cover the gap, and also on the bottom of the doors, to abut the concrete. The shed is not quite finished yet still have guttering & trim to complete. 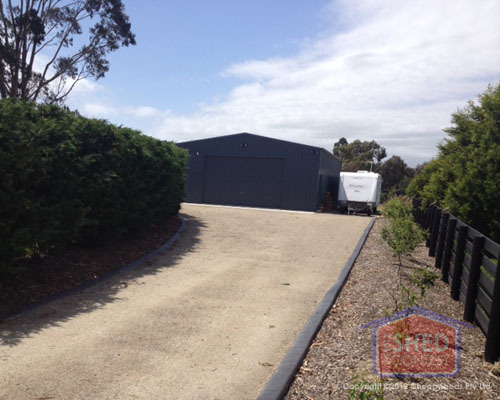 The garage is situated in our horse paddock, but surprisingly does not look out of place, I think because the trees soften the outline. I think it looks really good! But I may be biased, having built it myself, with the help of my wife, who is now a certified pop riveter!! Has been a dream to erect, as the plans etc. have been simple & easy to follow. 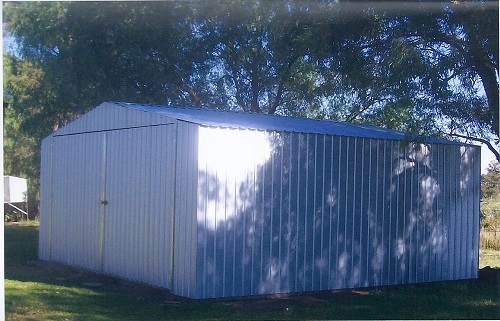 Highly recommended shed. 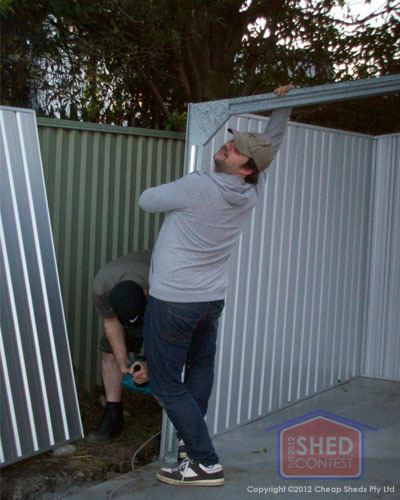 Gday guys, thanks again for our awesome shed and even better service! 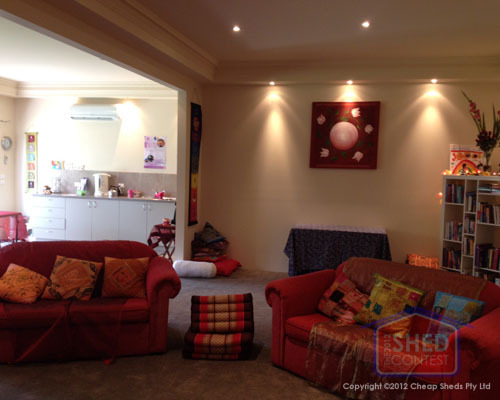 I have slightly modified ours and decked it out inside to get council approval to live in! We moved in here 3 weeks ago and couldn‟t be happier! Its got a 5 star energy efficiency rating and is a pleasure to live in, cheap temporary home to live in whilst we are building our next house. All up including the shed and all plumbing/electrical/ plastering building materials/ insulation it came to a total of 12k. I supplied the extra windows and doors. There are plenty of other couples like us who are looking at doing the same thing. 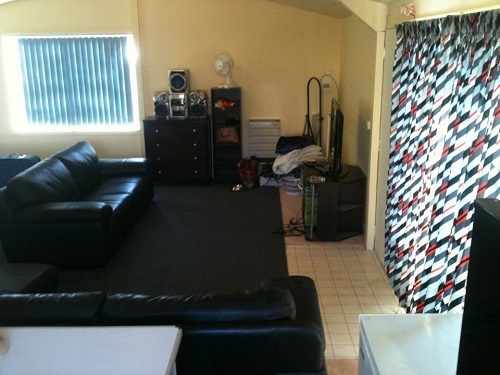 Its the cheapest/ coziest house getting around and will become the ultimate man cave when the house is done. Thanks again guys, I appreciate very much all the top service and prompt callbacks you provided. I have been recommending you guys to absolutely everybody! Hi there! 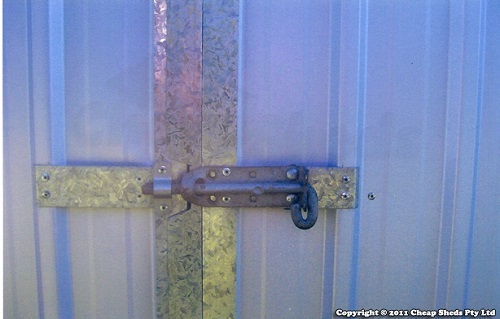 As promised, here is a piccy of our shed erected. 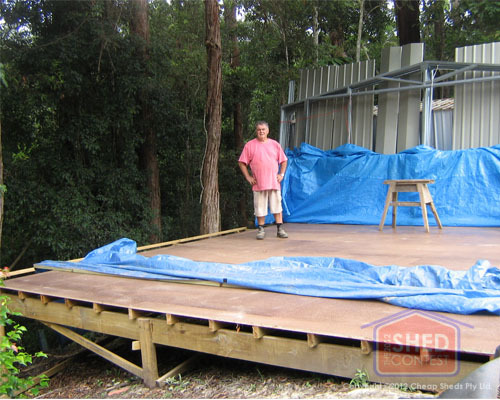 It took us a while to organise the concrete slab and get the site ready after a big tree had fallen on our last shed. Let us hope there is no repeat performance of that drama!! 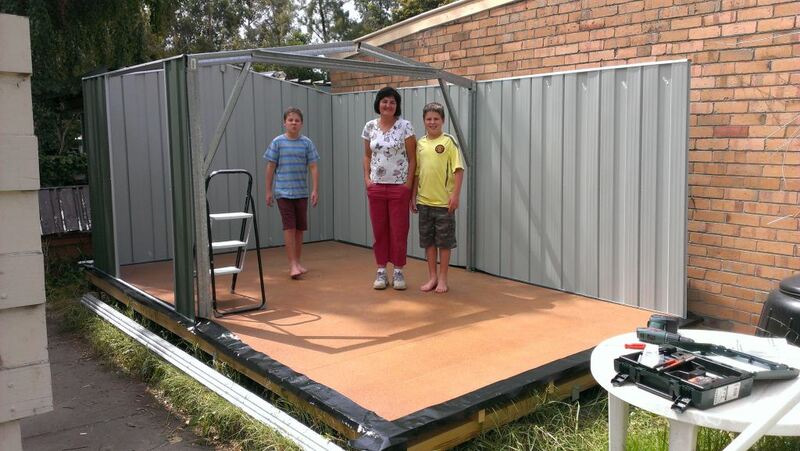 !The shed was easy to erect and the instructions were so explicit. We are in our seventies and did have a friend to help us but for us to be able to follow the plan we thought was amazing for older people.From the moment we purchased the package, the delivery, the follow up and advice given to us was excellent and we would highly recommend your company to anyone wishing to purchase a garden shed. 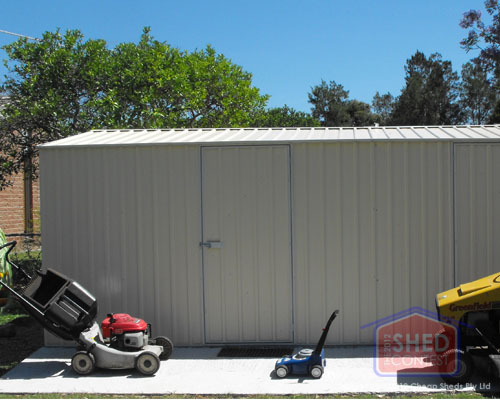 We will certainly use you any time in the future that we require any kind of storage shed on the property. Many thanks. 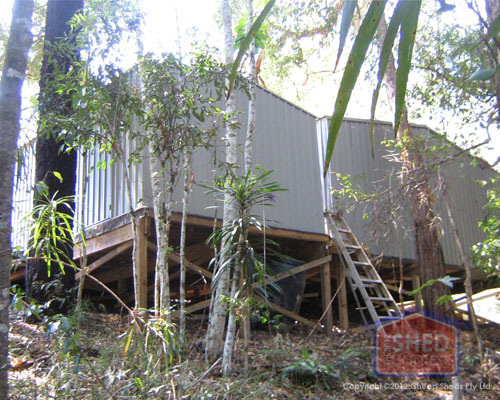 We built our dream pole home on our rainforest site near Bellingen NSW. 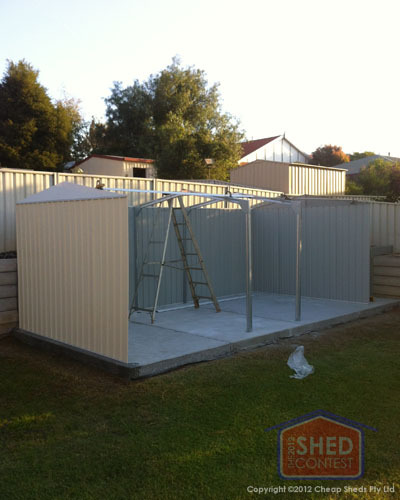 It was soon apparent that a shed would be required, but it would need to be a 'pole shed'. 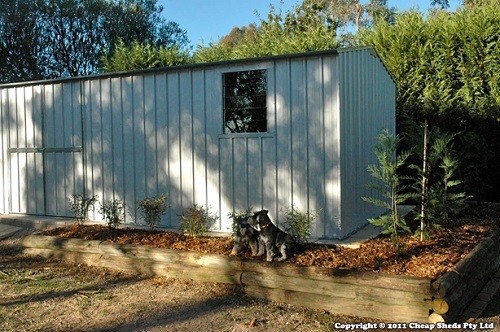 We loved the price and design of the steel sheds on the Cheap sheds website. but it looked like they were designed for concrete slabs. It was then that my wife's engineering skills came to the fore. In no time she had a rough sketch of what was required to realize the construction of a 'pole utility shed'. Unfortunately, I was to discover her enthusiasm disguised her plan to put all of her tools in the shed, and to leave my trailer outside. It all came to a head when I bought a boat. "Go figure another shed" I begged, and soon I had the plans in hand for number 2. 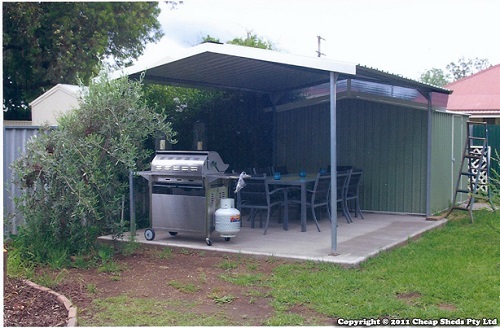 Now my boat and trailer are safely away, and we matched the colourbond 'Bushland' roof with a $45 electric spray gun from Bunnings. 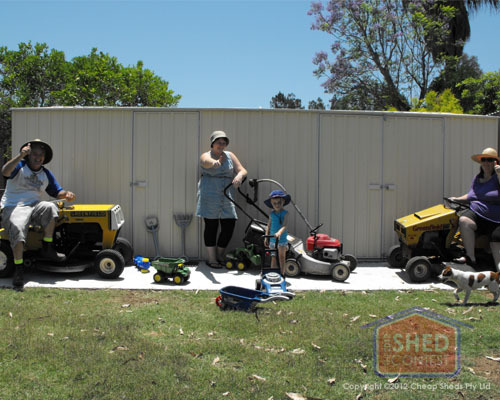 We love our sheds. 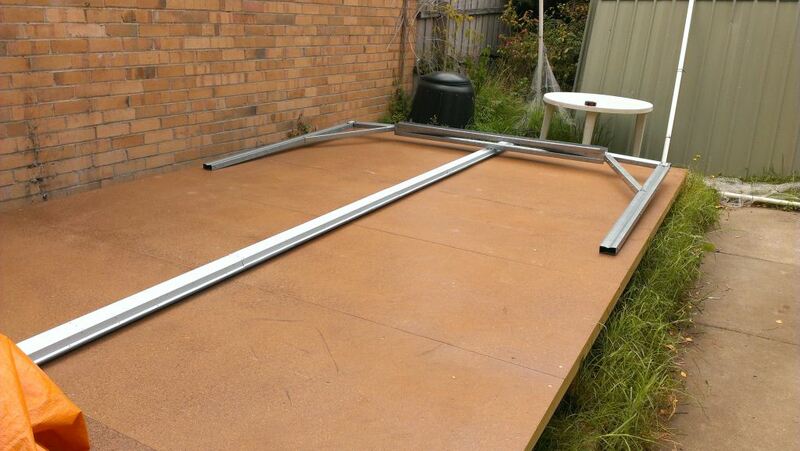 My wife, Agnes, and I tried to put up a 6m x 3m shed by ourselves and failed miserably as you can imagine. We (well I mostly) did manage to put all, well most of the panels together on 9 April after we had spent the previous weekend building the footings and base. 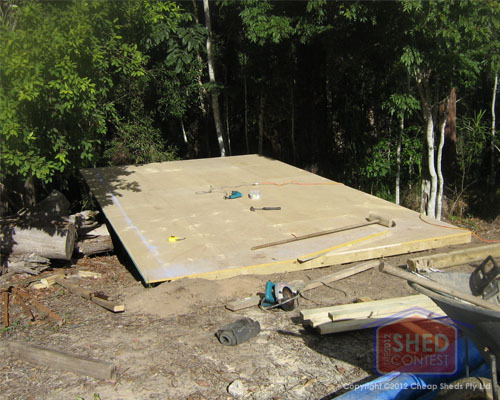 When we saw the enormity of the task confronting us we knew two people were never going to be enough to manage to erect the shed, although this ultimately proved to be wrong. Agnes then departed for a business trip in New York and left me to ponder how to finish the sheds. I called on my good friend Anton to lend a hand. Anton turned up in the pouring rain on 16 April tools in hand to help me put the shed together. Fortunately it was not windy. After much deliberation we decided to reverse engineer the erection of the shed and divided the back panel in two so the two halves were more manageable. We succeeded in putting one half of a back panel on a side panel and then the other half of the back panel on the other side panel and then joined the two halves. It was still pouring. 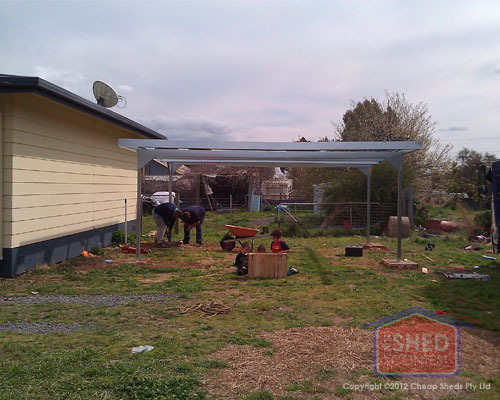 We held the three sides in place with the roof beam and an assortment of garden implements propping up the sides. 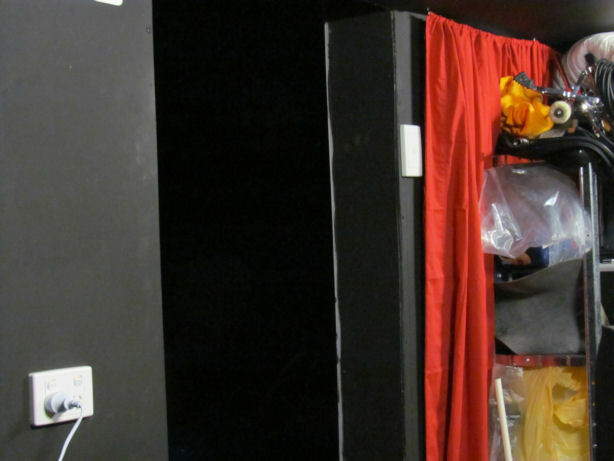 We then constructed the front panel (which Agnes and I had not done) and attached it to the sides and finally had four relatively stable walls. Well 3 ½ walls as the doors were not on yet nor the window in place for that matter. We used the cross bar to stabilise the structure and then could not move the roof panels in one piece so again we divided the panels in two and erected the four pieces one by one. It was an absolute joy when we finally managed to get the right half of the roof on as it meant for the first time all day we had some respite from the rain. Being dry was only temporary as we still had work to do. After attaching the other two roof panels we finally had a stable shed with a window but no doors. It was dark, we were very wet and had to call it a day. Anton arrived at 8.00am the next day to finish the shed and the sun was shining. 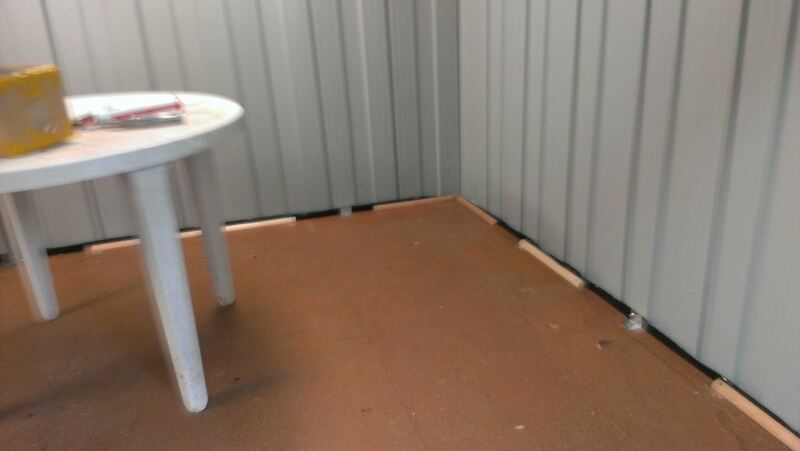 We managed to attach the doors, affix the additional screws / rivets to the shed that we had missed the previous day and secured the shed to the concrete pavers we were using as our base. Finally we finished around lunchtime on day 2! The construction (mainly due to dips in the pavers) was not perfect, but the shed was sound and ready to stand the test of time. If we had waited for Sunday‟s sunshine to start the shed I doubt we would have had time to finish it in one day even though our effort had been hampered by the weather on the previous day. When Agnes returned from New York the first thing she saw was that the roofline was not straight on the front of the shed (which of course I knew but tried to ignore). Thanks very much! Not to be perturbed on Good Friday I removed the individual concrete pavers, scooped out some of the road base and leveled the pavers so the roofline was straight only to find I needed to rehang one of the doors as it was now 10mm below the level of the other door. I managed to do this on Easter Saturday after borrowing Anton‟s rivet gun. 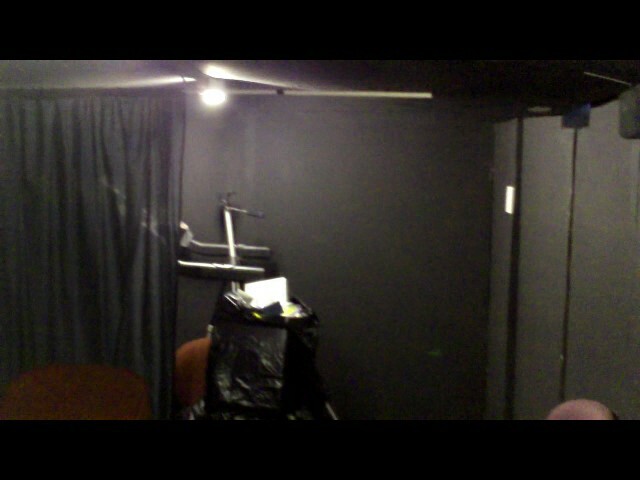 With this bit of fine-tuning the shed is now PERFECT! We collectively (Agnes, Anton and I) feel a great sense of accomplishment having done our bit to build the brick footings, filled it with recycled road base, lay the pavers and construct the shed. 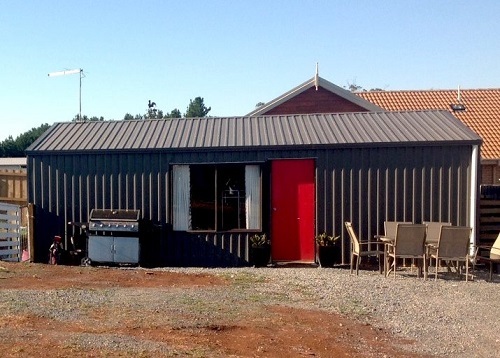 Over the Easter weekend I managed to start moving all manner of clutter out of the garage to the shed that is now used partly for storage, but more importantly has become my wife‟s garden shed to go with the Greenhouse we constructed together, but that is a whole other story. You can just imagine. 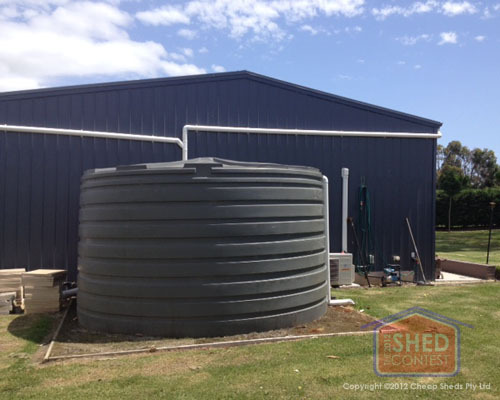 In this video you’ll see how Mackay local Dan Robertson uses some free space in his backyard to erect his very own double lockup garage. He now has somewhere safe to store the vehicles and also a very useful work area. Not only has that but his garage made a great addition to his family home. See Dan’s adventure below in this short video. 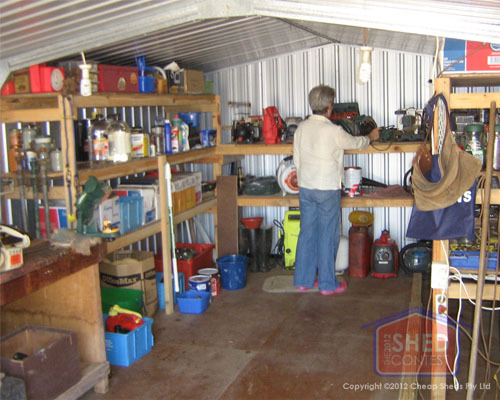 I wouldn‟t say that our shed is too unusual – it‟s a high quality, easy to assemble shed that looks good and does a great job of storing things…. nothing unusual there, but the reason we bought it may leave some people scratching their heads! Like all doting parents, we love our kids, and want them to succeed in whatever they choose to do in life. So, when we decided as a family that our kids would learn to play tennis, we naturally wanted to be able to practice with them at home. The cemented area under our back deck was „okay‟ to begin with, but the limited area, brick surrounds and overhead beams made playing tennis extremely difficult. We started thinking that a much better solution would be to empty our existing 6m x 9m garage (with 20 years of accumulation inside), and use this space for the kids to practice their ball skills. But what would we do with all that stuff???? 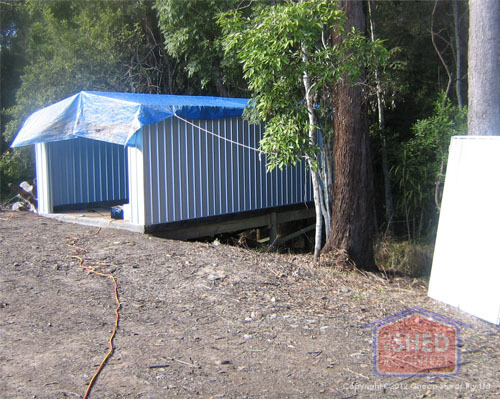 We found the solution in the form of Cheap Sheds and an Absco 6m x 3m Highlander, which was erected, UNDER our rear deck. 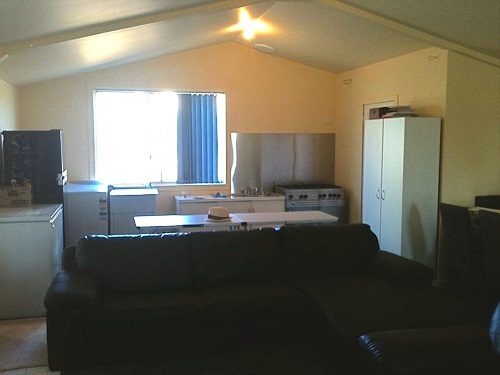 It‟s nicely tucked away, but very conveniently placed close to the house and electricity supply. Due to increasing pressure from the family to have the large shed emptied, not ALL of the de-cluttering was done before things were transferred from the old shed to the Highlander, so it‟s still a work in progress. The best part about this whole experience though, is that the children now have a place to practice their tennis skills, ride their bikes and just be kids, while we have a lot less clutter and a very usable multi-purpose area. The key to achieving all of this was the Highlander – a much-appreciated addition to our back yard, and one that will be used for decades to come! I am absolutely thrilled with my Absco Shed it is everything I wanted plus more. 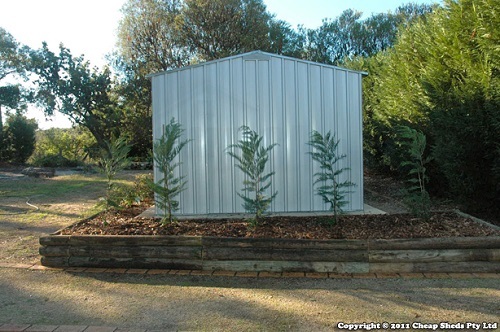 It is such a nice looking shed that it is now the stand out feature of the back yard. 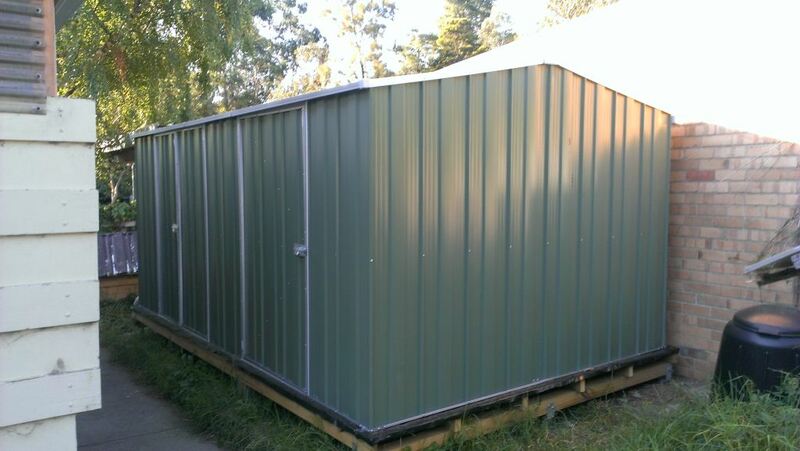 We moved from Cooloola Cove Qld to Kingaroy Qld and didn‟t have anywhere the amount of storage space we had and when I saw this shed on the cheap sheds Internet site I knew this would solve my problems. 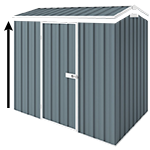 It really is a top class quality shed at a very reasonable price and I have highly recommended Cheap Sheds to all my friends and family. My daughter and grandson live with us and the little fellow is proud that he can park his lawn mower next to pops along with all his other garden toys. (lol hope he is this helpful when he gets older). 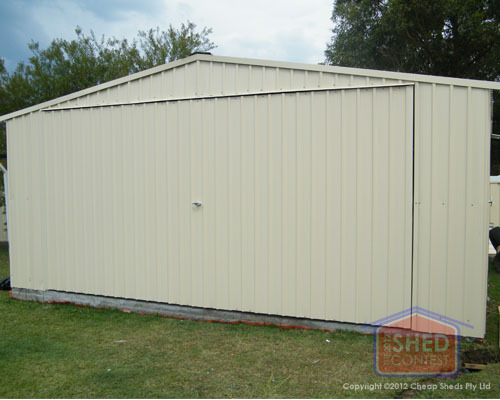 I would just like to finish by saying what a great business Cheap Sheds is, the standard of customer service is above anywhere else I have encountered and hope to do business in the near future when I would like to purchase a garage. 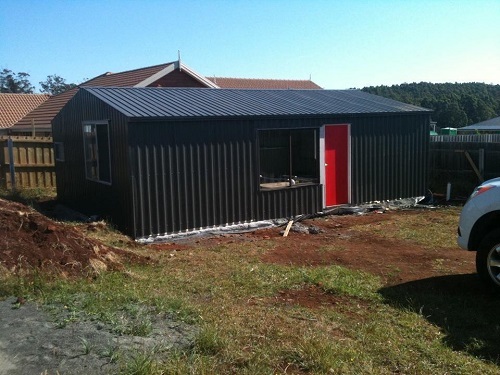 Rodney Smith sent in his photo to our team to show off his Eco Double Barn garage. . He sure loves his boys toys, with a beautiful motorbike parked next to his vintage car. There is ample space in this garage and he still has room for one more bike or maybe a workshop area. 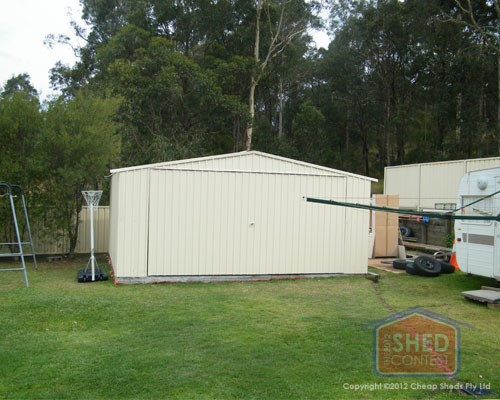 Love my shed especially the height for a back yard shed 2.4 meters. I have a 16-year-old blind and deaf Shetland sheep dog and whenever I open the shed door he wanders in to help. He lies at the work front getting covered in saw dust and when its knock off time out he comes. Put it up with 3 people in one weekend. Love my new "Woman Shed". Got plenty of space for everything I want. Hi my name is Paul. 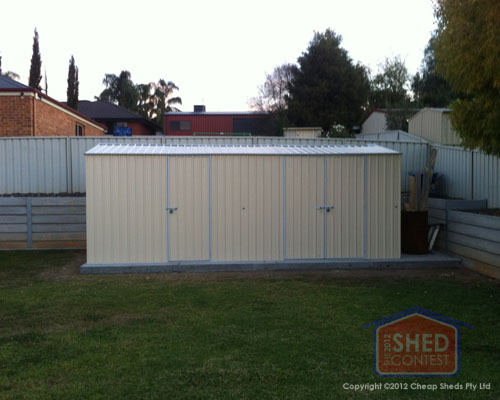 I purchased an Absco Shed from Krisztian at Cheap Sheds to help solve a space issue. 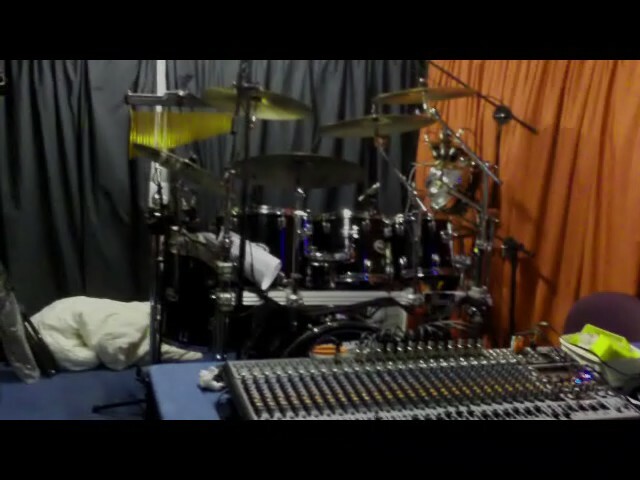 As a drummer for over thirty years I had accumulated a sizable amount of stuff and needed a controllable area to house it. 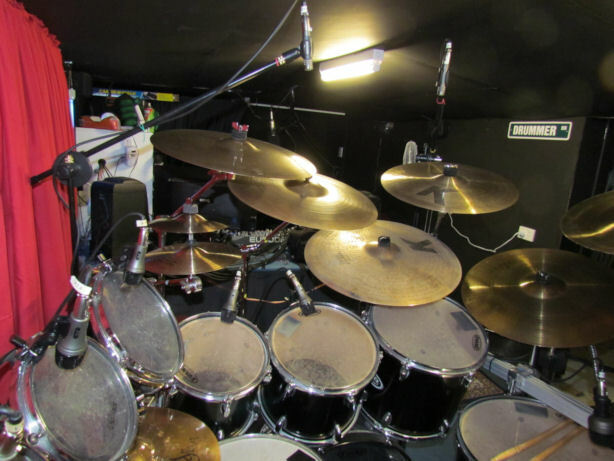 When I first started playing I had bought a three meter by three meter shed and after fitting it with two inch foam from the local foam distributor used it to house my kit and jam with friends, it seemed a relatively affordable way to create an extra room. So once again I thought this would be a good way to go, so after a suitable pad had been laid we set up the three by six meter shed and bolted it in place. An internal floor was poured to create a seal against the weather to reinforce this; several layers of plastic membrane were placed on the floor to about a quarter ways up the walls. I then created an internal frame with around a hundred l/m of pine, leaving a six-inch gap around the walls and a four-inch gap to the roof that was filled with 120 Rockwool insulation batts rated at R3.5. Around twenty-five particleboard sheets clad the walls and ceiling all held in place with 20.000 staples and hundreds of screws. 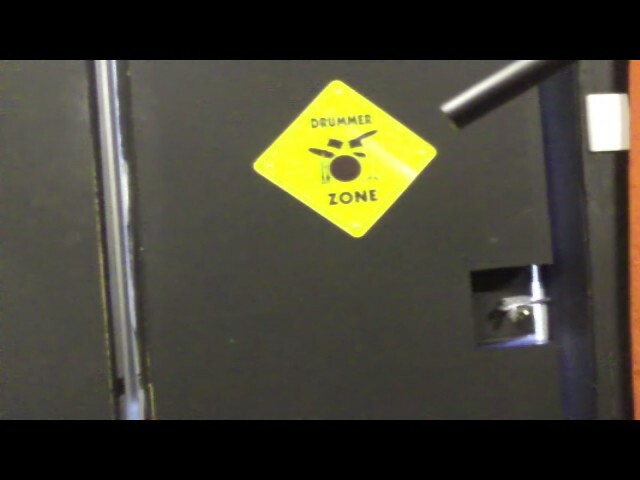 Every square inch of board was then painted Mat black, the front area around the drum had additional acoustic padding added then curtaining was hung to cover this and helps defuse Hi end sound waves. Finally the floor was carpeted, 23 although The Shed is not totally Sound Proof, we have removed around seventy percent of sound entering and a little more of sound leaving. 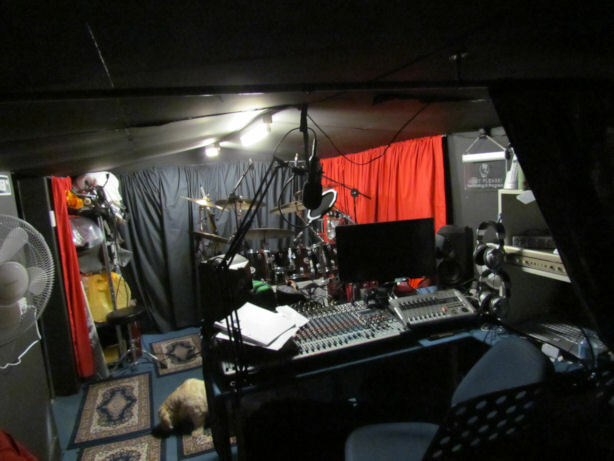 I record not only drums but voice and other instruments for various projects but it‟s also my fortress of solitude, a place I can go and write or create with out disturbing the neighborhood Having your own private recording studio a few meters walk from your back door has been an affordable luxury thanks to Krisztian and his Cheap Sheds. Something Extra that clanged in the night. 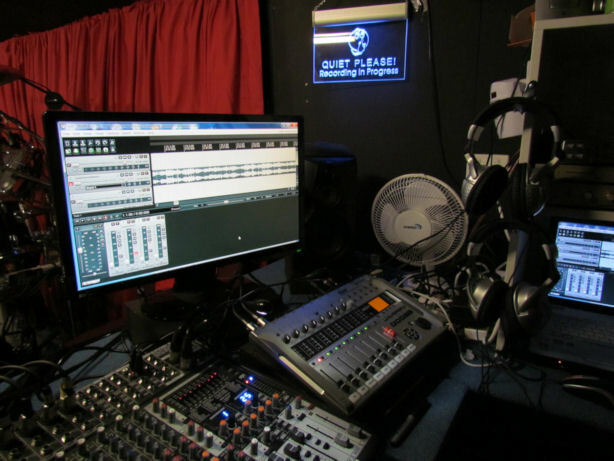 Just as a side note inside the shed or “The Cave” as it‟s known, I find recording at its best in the early hours of the morning there‟s no interruptions, no low-end car or truck noise to invade the very sensitive studio microphones. 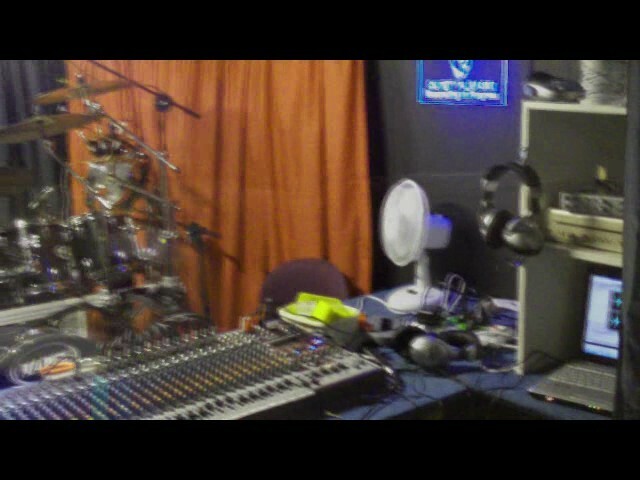 Sitting at the control desk recording some voice over early one morning I could clearly hear the cymbals on the drums in front of me being taped, I‟d look over and there was no one in the drum bay, so I reset to record again. Suddenly there was a tap from a cymbal in the headphones. I stood to get a better look and started to wonder if Krisztian had added something extra, paranormal even, with his shed package. 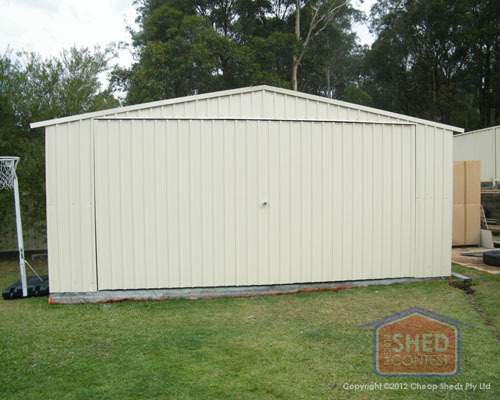 My 6x3 Colourbond Shed is absolutely the best Shed. It has the blood sweat and tears that make a shed a shed. 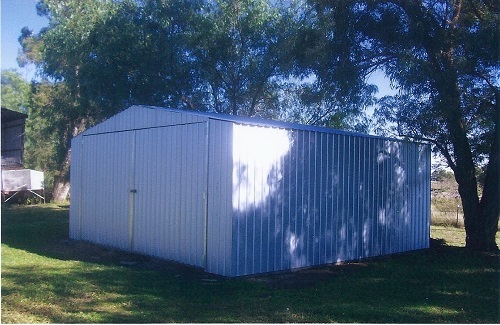 When I put this shed together with my partner it was easy. It looked fantastic when it was all finished. 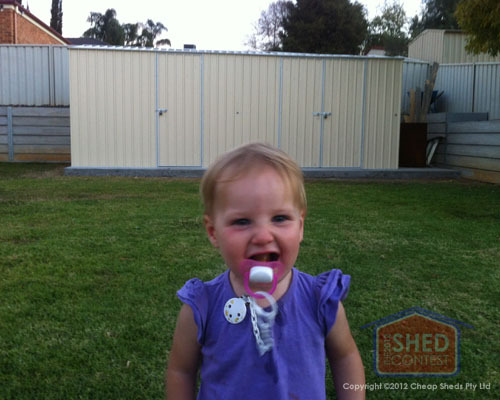 We had a lot on our minds when we put the shed together as in January my partner and I lost our beautiful little boy. He loved sheds in general, but I can guarantee he would have loved this shed. 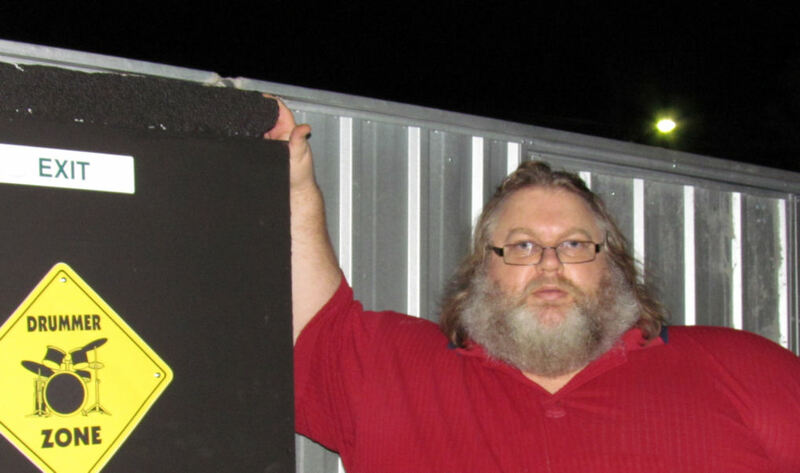 I definitely had a moment of madness that day and tried to fix the top flashing, as I hadn't put it together properly. Using the portal frames as support, despite all warnings about not getting on the roof ever!!!! I got on it and fell through it!!!!! Funnily enough it went back together perfectly as its excellent quality. For all who are reading, definitely purchase a shed you will not regret it, however DO NOT CLIMB ON THE ROOF OF YOUR EXCELLENT QUALITY SHEDS!!!! Because you will regret that. Believe it or not the pictures are after me falling through it. Well done if you could pick it. I have tinkered around in this shed for hours and my partner has no idea what I do in there... the answer is not much I just love being in my shed. It IS set up perfectly with a few shelves and most of all it makes my backyard. 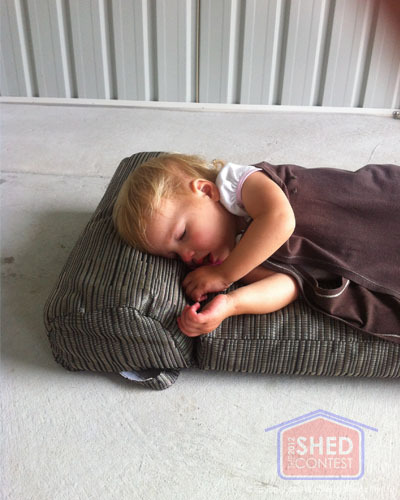 My beautiful little princess loves Dad's shed as well she even fell asleep in it! She is into everything, as soon as the door opens she is in it. I would like to add that if by chance falling through the shed did destroy it I would have purchased another in a heartbeat. Very reasonable price, Very good Quality, Easy construct and easy to rebuild hahaha. Thanks for a great shed. 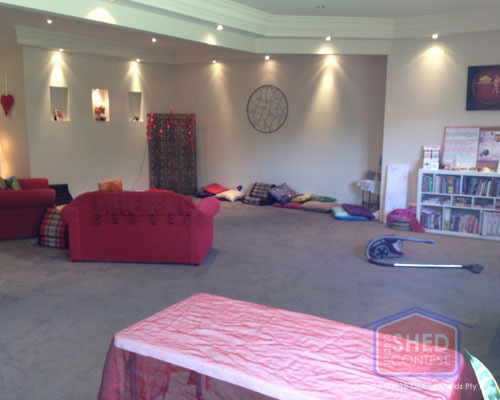 The 'Goddess Shed' was built for me by my husband for my business. 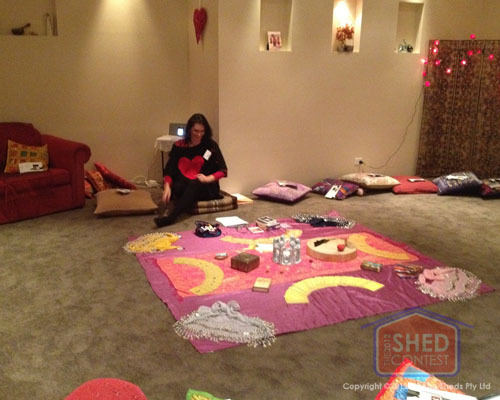 Each month Women gather in the Goddess Shed to attend the monthly Gorgeous Goddess Gathering. 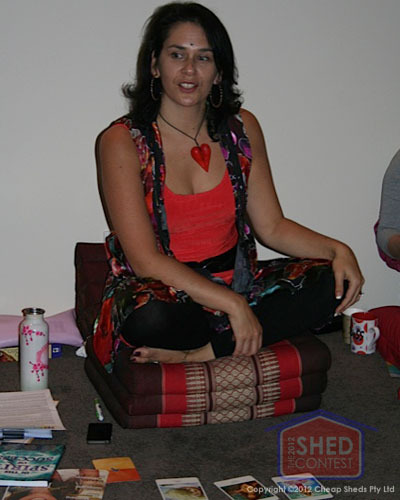 The Goddess Shed is like no other shed in Australia, here is what some others have had to say about this amazing shed. 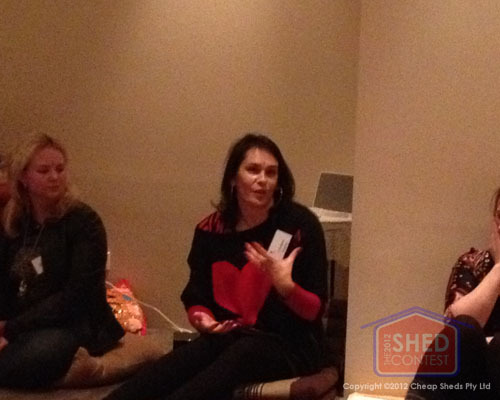 From Monika Mundell - "I've had the privilege to visit your shed about three weeks ago. I had already seen photos of it and those made me even more determined to see it "for real." The moment I stepped into your shed Luanne I felt I had just stepped into a very sacred place... something precious that needed the appropriate respect and courtesy. To me it's a combination of a retreat where illuminated artists can be at-one-ment with themselves. It‟s a place where goddesses can gather to celebrate their magic... and where rituals make perfect sense. It's a shrine to practice solitude and tap into brilliance. 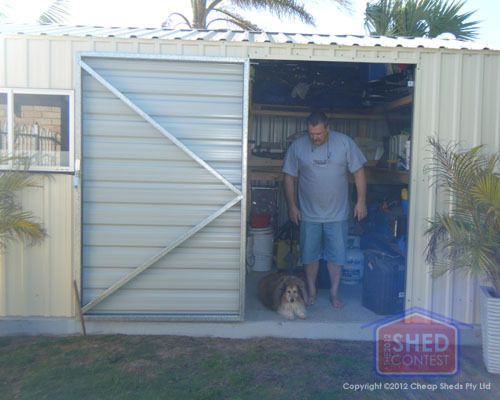 Your shed is gorgeous like you Luanne... and having seen yours I now want one myself." "I have been to the goddess shed on many occasions and the one thing that stands out more than most for me being highly sensitive is how serene it is, you walk into the door and everything that you brought with you stays outside. It is a place of loving, caring energy and will continue to grow as the years unfold. I love that it was created where it is and has a very natural flow around it and inside of it. 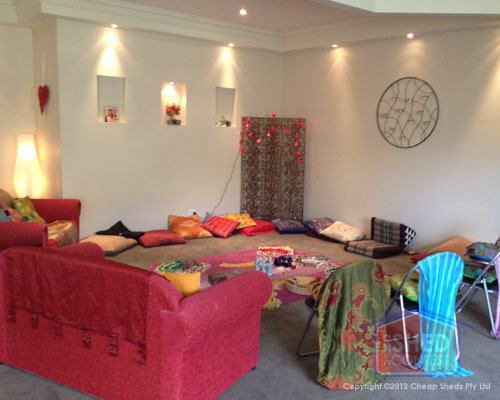 Love to you Luanne Simmons for such a beautiful space".